But...have you been able to find a barn owl, a calliope hummingbird, and a western bluebird around Harlem or Washington Heights? Well, thanks to the Audubon Mural Project, you can. 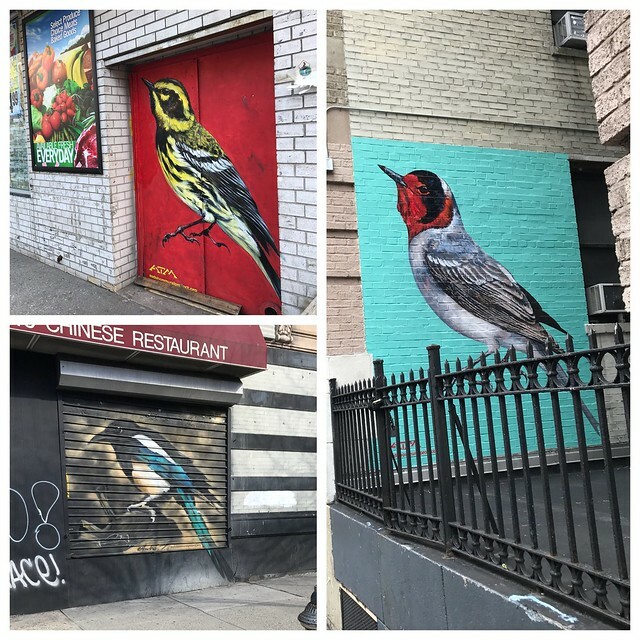 According to their website, "the Audubon Mural Project is a collaboration between the National Audubon Society and Gitler &_____ Gallery to create murals of climate-threatened birds..." Over the past four years, various artists have painted 82 of the planned 314 murals. You can take a guided tour of 30 of the completed murals in Harlem. These tours are limited to 20 participants who will learn both about the murals themselves but also the challenges the various bird species face. Even if you aren't able to take the guided tour, you can check out the website and find many, but not all, of the murals during the day. Why is this? Some of the birds are painted onto the [word for the gate in front of stores]. So maybe you'll spy a purple finch or an osprey on your evening walk home. (I learned that there is a bird named "the almighty boat-tailed grackle.") This is definitely a birding tour that calls for your camera and a nice latte. But if mural-sightings aren't necessarily your cup of tea and you'd rather venture out into Central Park, the Audubon Society still has what you need: The Insider's Guide to Birding in Central Park. Maybe you'll even spot my daughter's favorite (living) NYC bird, the peregrine falcon.